If in 2017, a group of young men had decided to emulate this odyssey, they would probably only have managed a part of the journey. Conflict and bureaucracy would have barred their entry to many of the countries they tried to cross. 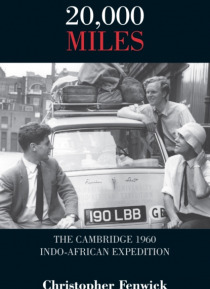 However, in 1960, three young Cambridge graduates bought themselves an Austin A40 and set off on a marathon trip via Colombo to attend a friend s wedding in Cape Town. … They took the long way there. Christopher Fenwick, along with his friends Robin Gaunt and John Maclay, set off across continents on the motoring adventure of their lives through Europe, the Middle East, Asia and Africa. Their staple diet was Fray Bentos steak and kidney pie, usually eaten at the roadside. They even meet old schoolfriends along the way in Iran and had tea with Mr. Nehru, the Indian Prime Minister, with his daughter Indira Gandhi and grandson Rajiv who were to follow in his footsteps. Their loyal saloon car suffered the ravages of potholed roads and mountains but friendly mechanics always came to their rescue, while the men soon became quite adept themselves at repairing and cannibalising the vehicle as it suffered various breakdowns en route. Eventually they made it to Ceylon from where they embarked for the last leg of their trip by boat via the Yemen, flying from there to Ethiopia and onwards through Africa to raise a glass of champagne in Cape Town.